One girls and boys wait was over, or just about to begin. Romantic songs won the day, and those songs are the ones that survived too right? Songs we still listen to and artists still record. Especially Michael Bublé. He always goes for those songs. 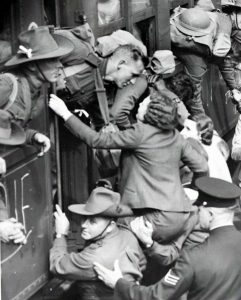 ”Waiting For the Train to Come In” was a big hit during the later part of the war, especially among women who could relate. Waiting and waiting, one train after the other. 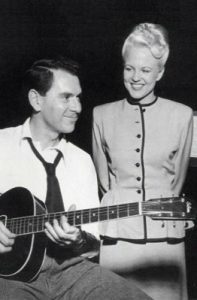 Peggy Lee and her guy, Dave Barbour. Peggy Lee got started during the war. In 1942 she had her first No. 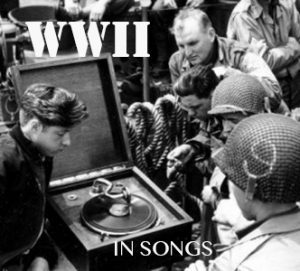 1 hit, ”Somebody Else Is Taking My Place”, followed in 1943 with ”Why Don’t You Do Right?”. ”Why Don’t You Do Right?” became a huge hit, it sold over a million copies and made her famous. She also sang with Benny Goodman’s orchestra in two 1943 films, Stage Door Canteen and The Powers Girl. In March 1943 Lee married Dave Barbour, a guitarist in Goodman’s band. Fraternizing with the girl singer was against Bennys rules. So Benny fired David and Peggy quit soon afterwards. ”I think that’s not too bad a rule, but you can’t help falling in love with somebody.” Peggy later said. When she left the band that spring, her intention was to quit the footlights altogether and become Mrs. Barbour, a fulltime housewife. It’s to Mr. Barbour’s credit that he refused to let his wife stay at home too long. ’You really have too much talent to stay at home and someday you might regret it.” He said.